In Argentina, there are multiple kinds of alfajores. Almost every town outside buenos aires have their own type. Some are more famous than others, some are super easy to make while others have more complex ingredients not found in the everyday supermarket. I like Alfajores de Maicena (maicena is cornstarch; Im almost sure that maicena was the brand for the ingredient and hence the name they received. They are good and easy to make, if the flour is removed it can be gluten free alfajores. The traditional ones have shredded coconut around, I like to chop the coconut and make it extra small. The secret? Spread dulce de leche on the outside of the lids for the coconut to stick to it. Preheat the oven to 350F. Prepare a baking pan with parchment paper. Combine the flour, baking soda and baking powder on a medium bowl. Cream the butter and sugar. Add the vanilla extract, lemon zest, cognac and the yolks. Mix for 3 minutes. Stop and scrape the bowl. Add the dries in low speed. Remove from the bowl and cut into desire size. Cook for 15-20 minutes. Cool down on cooling rack. Fill with dulce de leche and roll in coconut. **Storage: The alfajores can be store in an air tight container for up to 15 days. This recipe is simple and easy as 1,2,3. Same, same, but different from the regular sablee. Same ingredients, almost same quantities, one more ingredient: cacao. ** TIP: It can be store in the refrigerator for a month, and in the freezer for up to 3 months. Please label the bag with item and date. We tent to use the freezer as those big storage, where we keep putting things and never remembering what we have. I find my self guilty of these and since started to label everything I am better at keeping track and using things from the freezer. **Vanilla Dough: Replace the cacao for flour. I have started making cookies I think pretty much sixteen years ago when I first moved to the states. I started with the pre made ones, until I found a recipe behind the bag of Nestle chocolate chips. Always seen how fast they would be gone, I started making the dough and freezing it. Making sure there would always be a freshly baked cookie in the house. 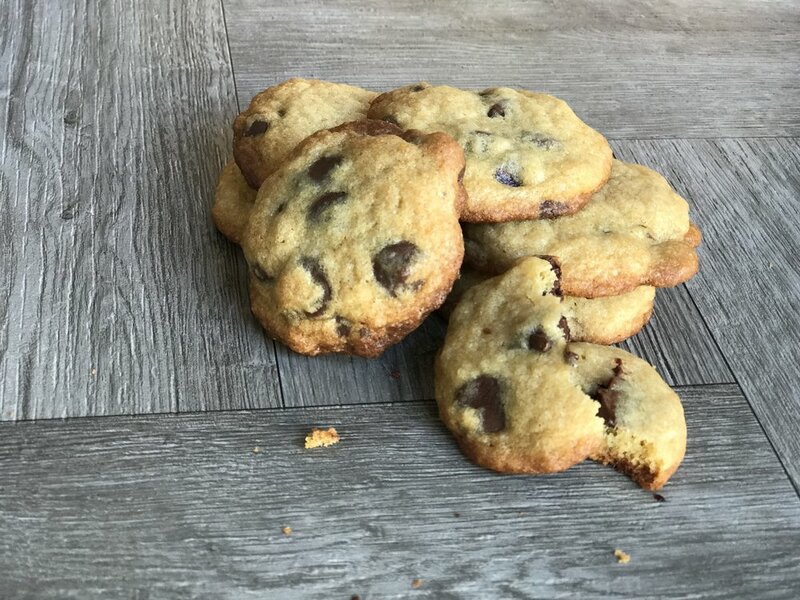 As i got more involved in the cooking I slowly switch into measuring rather than scooping and that also helped me improved the quality of the cookies. The prep time takes no more than 15 minutes, including mixing time. They would go in the oven for 7-9 minutes, and boilaaaa, you have goey fresh baked cookies to enjoy! Cream the butter and sugars together. Add the vanilla extract and the egg. In a small bowl combine the flour, baking soda and salt. Add the dry ingredients little by little, do not over mix. Add the chocolate chips. Scoop the batter to the baking sheet and bake for 7-9 minutes.